Khon Kaen University (KKU) is the oldest and largest university in north-eastern Thailand, covering an area of approximately 9000 hectares. It was established in 1964 as one of four regional universities. Khon Kaen University International College (KKUIC) is a recent addition which aims to be a focal point for international education in the region, by focusing on the integration of theory and experience with the benefit of cultural diversity, critical thinking and innovation. This is achieved by mutual respect, cooperation and responsibility. At KKUIC, it is the students themselves that are the priority as they are groomed to be the future leaders of our respective societies. To enable this to happen, programs are tailored to our students with individual support and mentoring to allow everyone the opportunity to succeed in a safe and friendly environment. More than one hundred Thai teachers of English from Udon Thani Primary Education Area Office 4 attended training concerning the Common European Framework of Reference for Languages. It is proposed that this framework will be adopted in Thailand in the future and these teachers were very keen to understand what the framework means for Thai teachers of English in this education area. Having worked in UK for eight years using the framework, KKUIC was only too happy for me to help with the training. This training was different from the normal training that I have conducted recently because these school directors and supervisors have a different set of problems compared to the teachers that I usually have the pleasure to train. This was a very enjoyable session and I look forward to next year when I hope I will be invited again to contribute to the English language development of these very motivated directors and supervisors of Area 4. Teachers from all four districts under the supervision of Area 4 attended this training at the Karin Hotel in Udon Thani and it was great to see many teachers who were formally my students at the event. Everyone seemed to enjoy themselves and came away with at least something they could use in their classrooms in the future. Doesn't time fly when you're having fun! Another year over and time to have a bit of a laugh with our students as everyone prepares for the holiday that is nearly upon us. 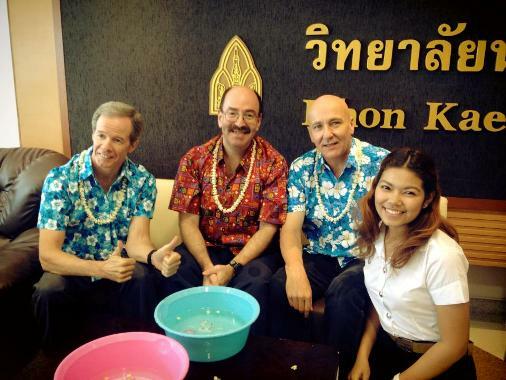 Best wishes to all at KKUIC and I hope that everyone is safe over the Songkran period. We were very lucky to have some good entertainment during the celebrations. A special thank you to Thomas and the boys for a cultural show with a difference. What a great way to say 'congratulations' to the most recent graduates of KKUIC and wish them all the best for the future. On 14th December 2013, the KKUIC staff and graduating students gathered to record the coming of age of our latest students. Good luck to our graduates and I wish all of them well for the future in their chosen careers. Mattayom students from Boribalphumiket School attended an English Camp and KKUIC were actively involved in providing support for these grade 7-9 students. The area that was given to KKUIC to focus on was pronunciation, so various card games and activities were organised to ensure that all the students had the opportunity to be involved and to practice their English language pronunciation. A special thank you to everyone at the school for making me feel so welcome. In addition, thank you to the students who were not part of the English Camp who also joined in with some impromptu activities. KKUIC was very happy to contribute to this annual event. 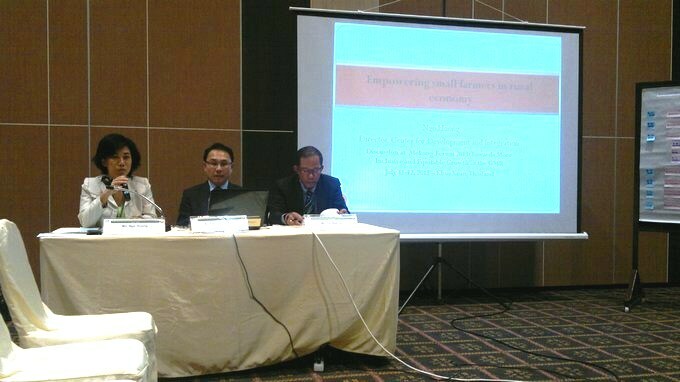 This year, the theme was Initiating ASEAN Integration: Empowering English Teachers. The event was well attended by very enthusiastic participants who took part in lectures and activities from 14th - 22nd October 2013. Thai English language teachers from all over Thailand attended the seminar with a view to preparing their students for the ASEAN Economic Community and the changes that will take place in the region over the coming years. 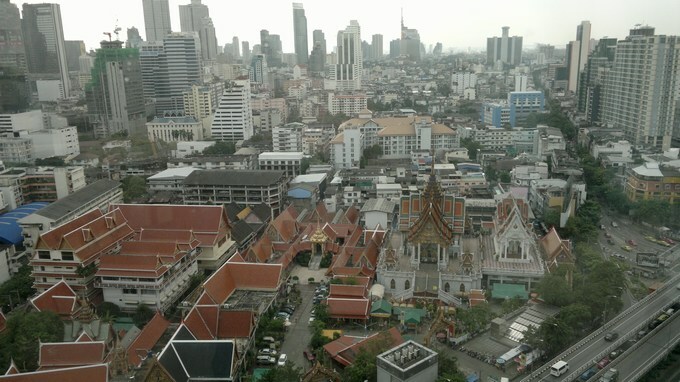 The photograph was taken from the new offices in Chamchuri Square. What a view! Supervisors from Area 4 were put through their paces at the Karin Hotel in Udon Thani as part of a concerted effort by the management to help improve the English language skills of all staff. Activities included shopping, which I found particularly interesting as most of the supervisors knew more about it than me. Giving directions and describing places were also demonstrated and role-played allowing all participants the opportunity to practice their language skills. There are 156 schools from four districts under the watchful eye of Primary Education Area Office 4 and it was back to the Karin Hotel for the school directors this time as they were put through their paces by PEER Center staff and invited teacher trainers. KKUIC were very happy to help with the training and look forward to the opportunity of assisting again in the future. The school directors were very enthusiastic and participated very well in the activities that were laid on for them. This school was interested in KKUIC providing some training for the annual round of competitions that are coming up soon. Subjects included speeches, listening, pronunciation, spelling and story-telling. I have not been to this school before; however, the teachers were very persuasive, so I decided to pay them a visit. They made me feel very welcome and the students worked very hard as I put them through their paces. I am sure the students will do very well when they compete in their various competitions and I thank them all for making me feel so at home during my stay. The Karin Hotel in Udon Thani was the venue this weekend for 160 primary school teachers who were there to learn about the new Teachers' Kit. Remember that the majority of English at primary school level is taught by teachers who majored in other subjects. The teachers were very good and between taking photographs, they took an active part in all the activities that were provided by the trainers selected from the local area under the guidance of Primary Education Area Office 4. Everyone had a good time whilst they listened to their trainers and produced their lessons for the demonstration phase of the training. 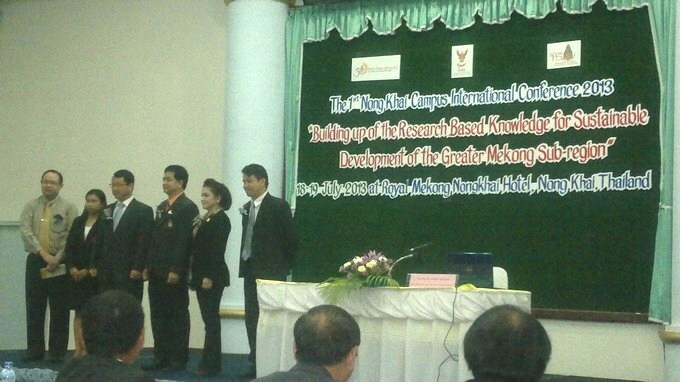 This conference was titled, 'Building up of the research based knowledge for sustainable development of the Greater Mekong Sub-region' and involved participants from the GMS region sectioned into two strands. The first strand was Science and Technology and the second contained Humanities and Social Sciences, Education and Business management and Tourism. This allowed plenty of time for groups to present their findings to the attending delegates for scrutiny. Prathom 5 and 6 children from surrounding schools joined the students from Bantatprachanukoon School in a three day English camp organised by the PEER Center located in Bantatprachanukoon School. 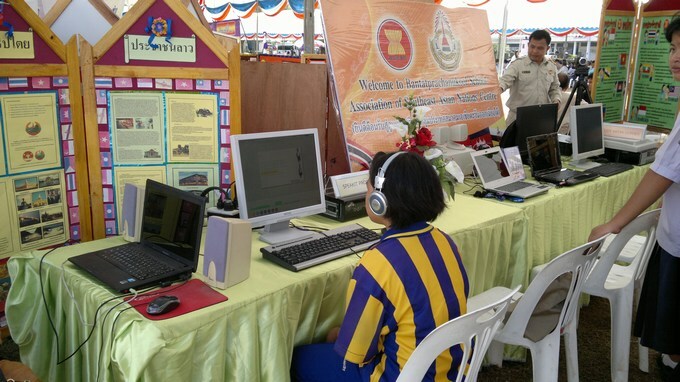 Activities were laid on for students covering all four skills as well as vocabulary, grammar, pronunciation and activities emphasizing ASEAN. 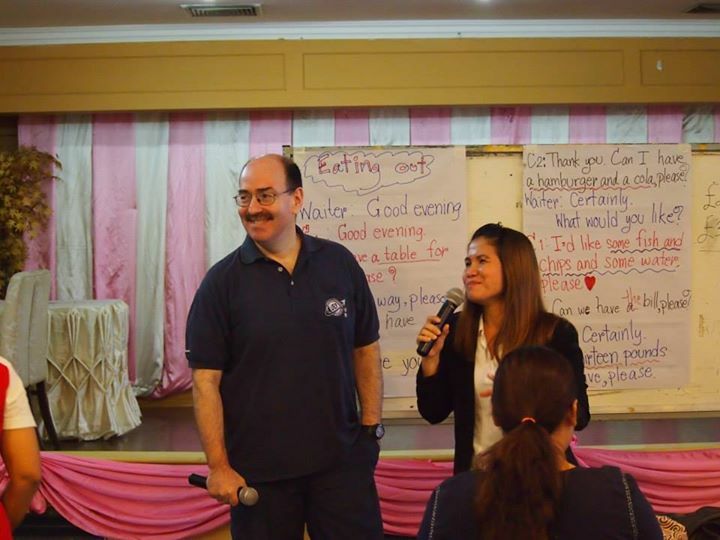 This training consisted of presentations and activities designed to illustrate how soft skills development and an ASEAN context can be added to a teacher's repertoire with the minimum of effort allowing the teachers to prepare their students for ASEAN integration in 2015 and at the same time, giving them the tools they need to think critically, solve problems and develop their remaining soft skills at the same time. This conference was titled, "Local Community: The Foundation of Development of the ASEAN Economic Community" and took place at the Centara Hotel and convention Center in Khon Kaen over two days. Khon Kaen University has an important duty to create innovative learning processes to solve problems and develop the community, particularly in the north-east of Thailand. 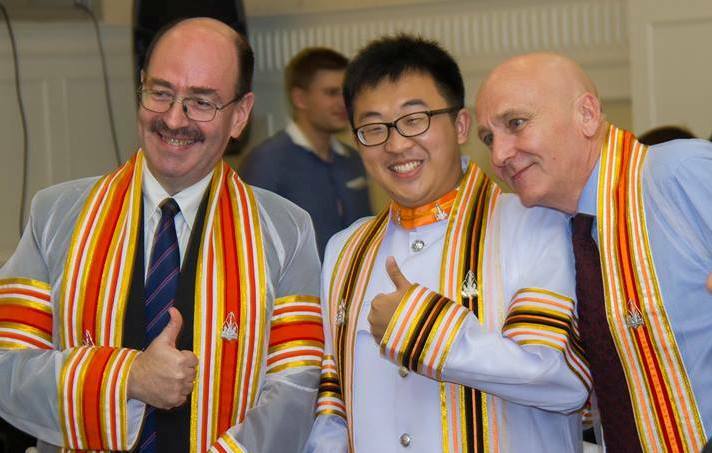 As the leading international educational provider for the Isan region of Thailand, Khon Kaen University International College is very proud to play an important role in this process. 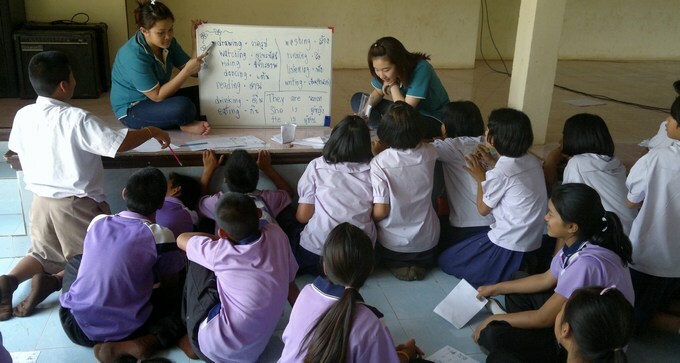 The Nongsaeng PEER Center in Udon Thani, in conjunction with Khon Kaen University International College recently held some English language training for approximately fifty primary school teachers. The first two days, teachers learned how to use communicative activities in the classroom and then on the third day, they put their new skills to the test by simulating their own English Camp. The teachers were very enthusiastic and made the whole experience extremely enjoyable. At the end of the training, each school was presented with their own set of 'Smooth Transitions' DVDs for use in their classrooms by Udon Education Foundation (UEF). Another year over and a good excuse to break out the loud shirts again. Happy holidays to everyone, especially our KKUIC students. Remember to be safe over the holiday period, it's a jungle out there! Finally, our students were able to have their graduation ceremony and be on their way to bigger and brighter things. Good luck to all our graduating students. 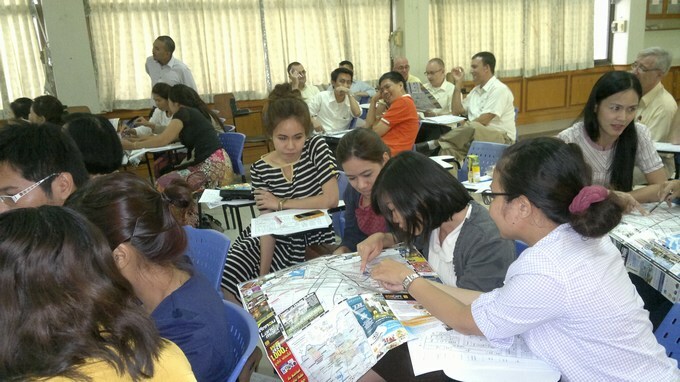 A nine day course took place to allow the teachers at Khon Kaen Vocational College the opportunity to practice their English language skills in an ASEAN environment. English language functions were used in conjunction with the languages and cultures of ASEAN countries allowing the participants to conduct presentations and role-play activities for the duration of the course. The teachers were very motivated for the tasks that were presented to them and the course proved enjoyable for all those who participated; especially me! I would like to personally thank all those concerned for making my time at Khon Kaen Vocational College so memorable. Khon Kaen Vocational College has many very active teachers. Here is an example of a physical training instructor at work during her English language training. A shy retiring person, she manages to overcome her fear of public speaking to successfully deliver her presentation during the initial days of the course. 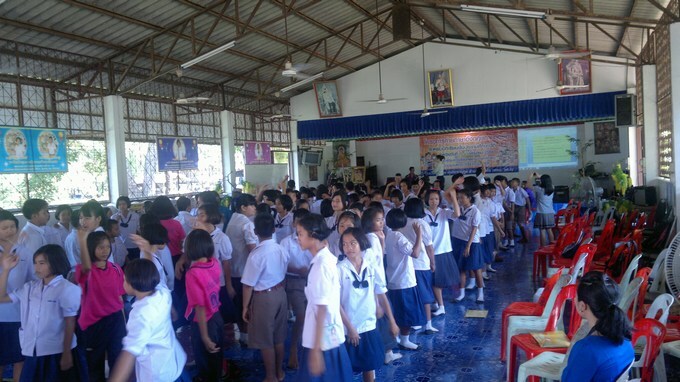 Students from Khon Kaen University International College conducted a successful English Camp for children in grades 4-6 at Ban Khok Na-Gnam Plasiem School in Khon Kaen as part of their ongoing community service activities. Around 130 children took part in communicative activities and vocabulary and grammar games over the course of one day, allowing the Prathom pupils to use English in context as well as have the opportunity to mix with International College students who acted as role models, demonstrating what they themselves could become in the future. 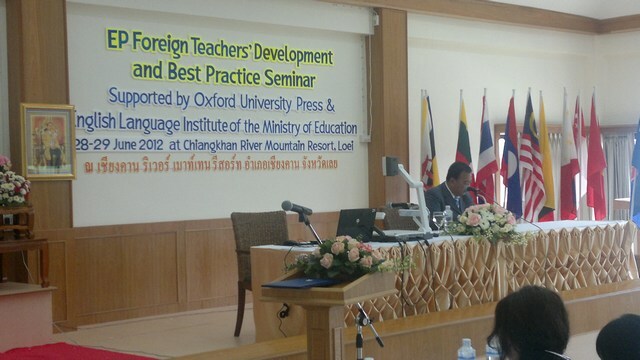 Khon Kaen University International College hosted two half-day seminars for primary and secondary school teachers on the subject of government policy concerning Thailand's integration into the ASEAN Economic Community and the socio-cultural effects that impact English language teaching in Thailand's basic education sector. A special thanks goes to MM Publications for their co-operation and collaboration in producing this seminar. Khon Kaen University International College in conjunction with Udon Education Foundation (UEF) were given an opportunity to show visiting dignitaries as well as the general public the scope and progress of recent research that has been carried out in Bantatprachanukoon School in Ban Phue district, Udon Thani province over the last semester. The ERIC Center at this school, its staff and pupils have been cooperating for some time in helping to develop teaching materials, teacher training and the implementation of voice recognition software. On display were the Smooth Transitions DVDs for use with primary school English language learning as well as students being assessed using the SpeaKIT voice recognition software. In addition, the latest language analysis and user guides for course books was made available for public scrutiny, as well as classroom videos and photographs of students using the materials and equipment. 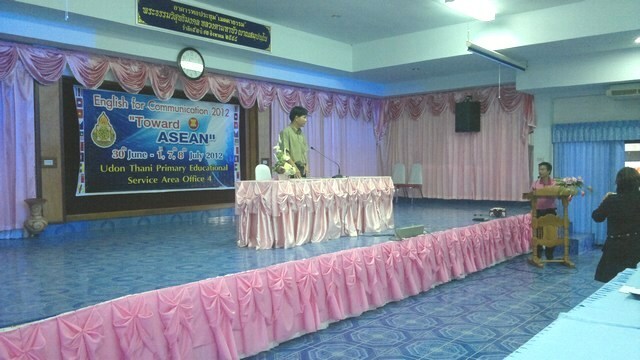 Khon Kaen International College held their first debating competition which involved training and support for all interested parties before the competition started. The idea was to introduce everyone to this demanding English language event with a view to KKUIC entering teams in regional, national and international competitions in the future. The winning team is pictured above in deep thought, planning their tactical strategy. 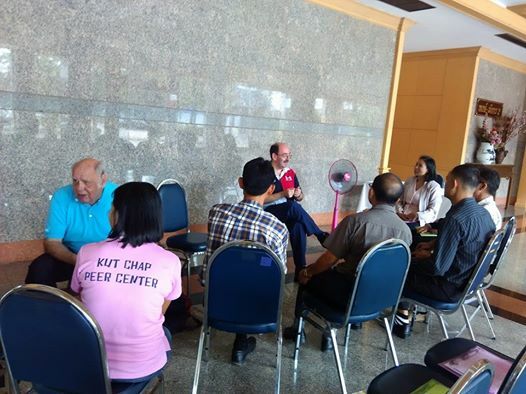 KKUIC were invited to help out with teacher training for Thai teachers of English who wanted to learn communicative English in a relaxed environment. After completing activities over the two days, teachers gave role-play activities demonstrating the skills they had learned over the period. Everyone had a really good time and found the activities challenging and most of all, a lot of fun. 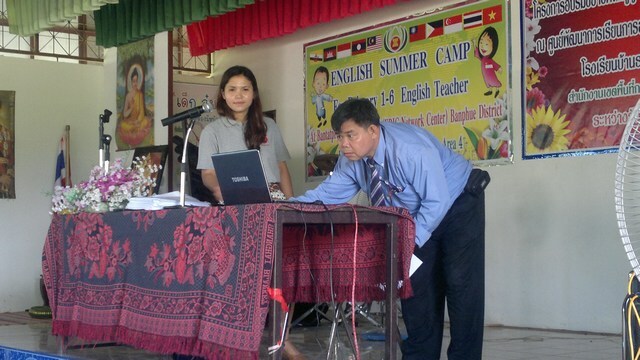 Khon Kaen University International College (KKUIC) conducted a successful English Camp staffed by lecturers and students for four schools in the local area as part of its ongoing series of outreach programs. The schools attending were Nongka, Kambon, Naprang and Kaina schools and all the participants were primary school children. The English Camp was attended by the Dean of KKUIC, Assoc. Prof. Yupin Techamanee, Ph.D. and the Assoc. Dean for Academic Affairs, Assoc. Prof. Kamoltip Brown, Ph.D. who watched as the school children were put through their paces by the faculty staff and students from a variety of majors who volunteered to help run the camp. This was a very successful day, judging by the response of the young participants and KKUIC look forward to the opportunity of conducting similar training in the future with these four local primary schools. This time it was off to Roi-Et with Ajarn Anu for some communicative activities with the students and teachers from Watnonsamran School, which is the primary school that Ajarn Anu attended when she was a young student. We look forward to visiting again to see the progress that both teachers and students will be making in the future. This training was devised in order to offer support to members of staff from Udon Thani Educational Service Area Office 4 and directors of schools in the area. Participants gave presentations and demonstrations of various language functions illustrating their competence in the use of English in a range of situations. Materials for this training were adapted from the course, English for Communication in Multicultural Societies which was developed from an existing course at Khon Kaen University International College. Prathom teachers of English took part in various activities that could be used effectively in local classrooms once they returned to their schools. Areas covered were the four skills (reading, writing, speaking and listening) as well as vocabulary, pronunciation and grammar. Teachers had the opportunity to have a hands-on approach to this training allowing them to experience for themselves what their students have to do in the classroom. 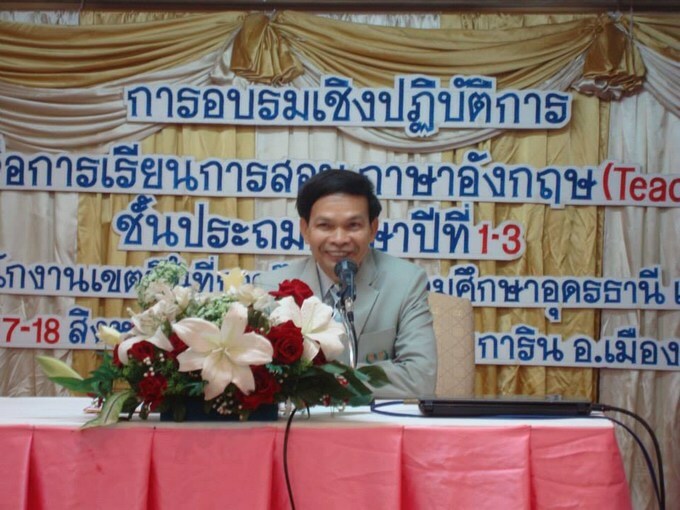 An audience of approximately 150 foreigners and English Program Heads attended a seminar dealing with such topics as Curriculum 51, Thai culture and the use of course books and supplementary materials in the English language classroom. Throughout the seminar, participants were encouraged to take an active part in discussions and activities so that they could take away as much as they could from the experience. The seminar was well administered by Loeipittayakom School and took place in the excellent Chiangkhan River Mountain Resort. A big thank you to everyone at the resort, Loeipittayakom School and Oxford University Press for making everything run so smoothly. Mathayom teachers of English took part in an English Camp designed to give them the opportunity to develop their teaching skills and exchange ideas in a friendly environment. Games and activities were carefully chosen so that teachers understood their relevance and appropriateness to the learning process. As well as being an important part of the participants continual professional development, it was also great fun as everyone took an active part in everything that was going on. 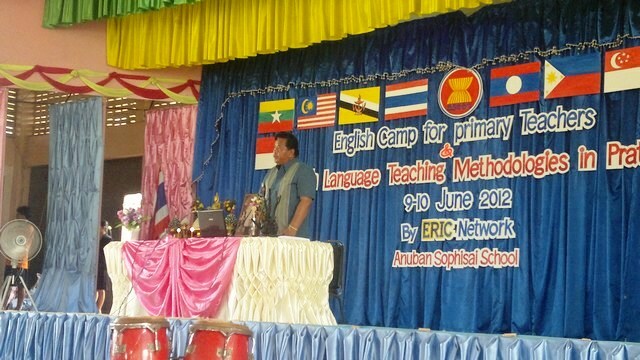 A great English Camp took place administered by the ERIC Center involving about 220 primary school students from So Phisai district. This was also the chance for old friends to get together. In this picture Maliwan, Sky and Irada joined me to remember the BA English, MA TESOL and B Ed English courses that we took part in over the last seven years. 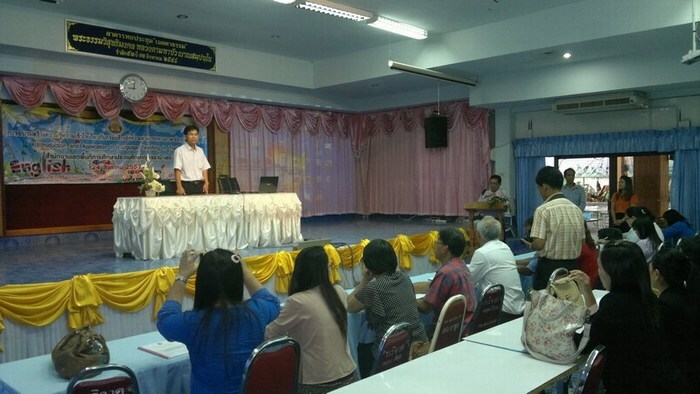 Two days of teacher training were undertaken by primary school teachers from So Phisai. Some of these teachers had been trained to be English teachers and some were majors in other disciplines. All the teachers worked really hard and had an enjoyable time preparing for the forthcoming English Camp that they have planned for their students; as well as refreshing their classroom methodologies for use in the normal school environment. 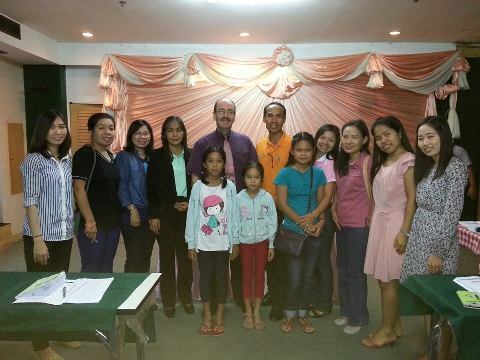 KKUIC were happy to assist the ERIC Center and look forward to the forthcoming English Camp. 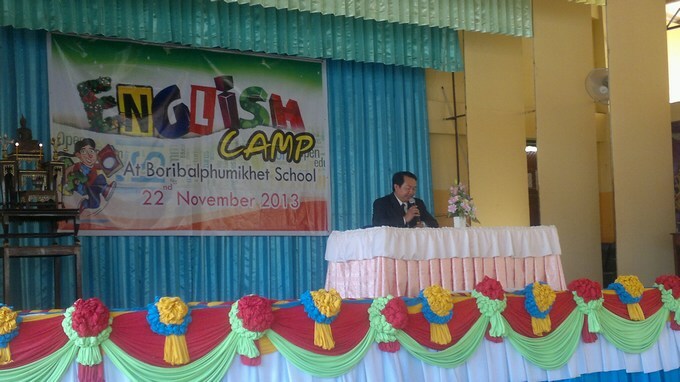 One of the responsibilities of KKUIC is to help out at English Camps around the country. 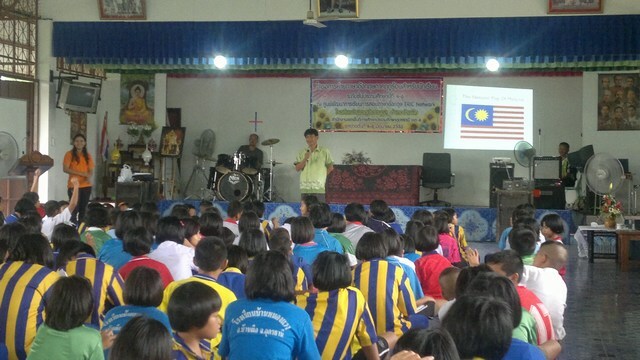 About 120 students from local schools in the Ban Phue district attended an English Camp hosted by the ERIC Center at Bantatprachanukoon School. Teachers from four districts came and helped out to make the camp an enjoyable as well as an educational event. 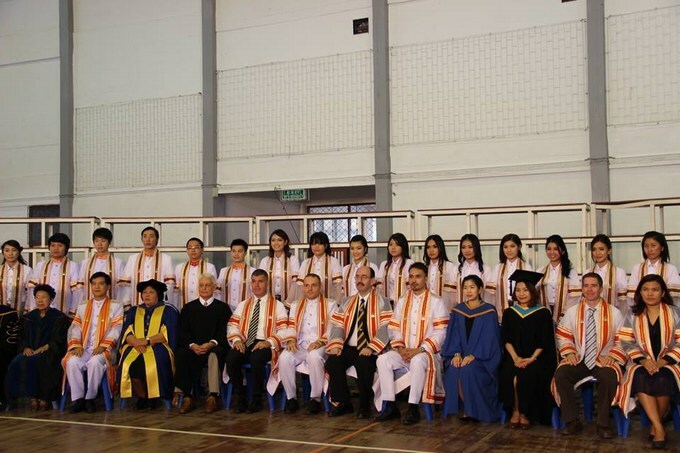 On 28th March 2012, KKUIC faculty and staff celebrated with our first graduating class in the Pullman Hotel in Khon Kaen on the occasion of their graduation. Everyone at KKUIC wishes them well for the future and look forward to when they return as part of our alumni. 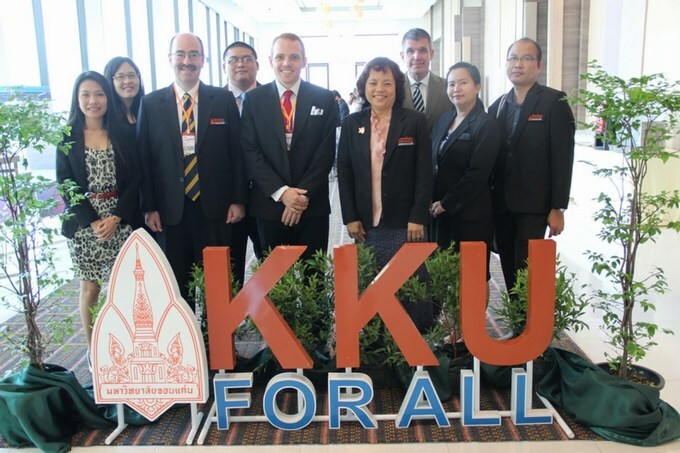 This year, the KKUIC annual seminar drew approximately 130 participants to Khon Kaen with a view to learning how existing materials and methodologies could be adapted to reflect a more ASEAN flavour as the 2015 ASEAN Economic Community draws nearer. Have a look at the winning presentation that had the audience in stitches as well as me. It's all very well saying that learning has to be fun, but this is just unbelievable. This year, Songkran produced three wise monkeys. See no grammar, hear no grammar, speak no grammar (Lucas 2012). Can you correctly match the category to the monkey? KKUIC took part in the first ever competition of this kind. 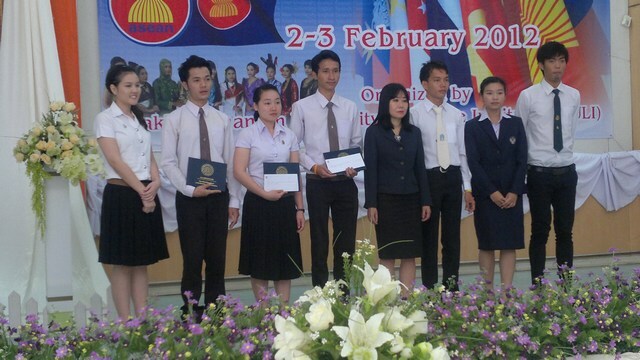 The contest was open to university students from the Greater Mekong Sub-region (Thailand, Vietnam, Lao PDR, China, Cambodia and Myanmar) and took place at The Language Institute, Nakhon Phanom from 2-3 February 2012. The competition was to be staged last November but had to be postponed due to the floods. This is an excellent competition and was thoroughly enjoyable. The organisers were very welcoming and the competition was conducted in a very student-friendly way. This year's topics were focused on the forthcoming ASEAN economic community and how it will affect local communities, universities and students. KKUIC hopes to bring more students to take part in the next competition, probably in November later this year. KKUIC was invited to the College Fair at Ekamai International School as the International College has a reputation for providing up to date information about the significant benefits that students can obtain by having an international education. Our PR Officer, Nonglak is seen here giving a presentation to the Head of Guidance and Counseling, Udom Saengsawang at the end of a fruitful day of activities. The training was for high School teachers of the area as well as 4th year students from the university and a few teachers. The idea of using newspapers to teach English is nothing new; however, all participants were able to take something from what was on offer and hopefully will try out their new skills in the classroom in the near future. Khon Kean University International College (KKUIC) is always willing to assist local educational establishments with teacher training and educational support as an ongoing commitment to the local community. Look at the slideshow to see the participants taking part in the workshop. The Deputy Director of Udon Thani Primary Educational Service Area Office 4, Panya Jankong brings to a close a successful workshop in English language teaching methodology for selected primary school teachers of English in the area. 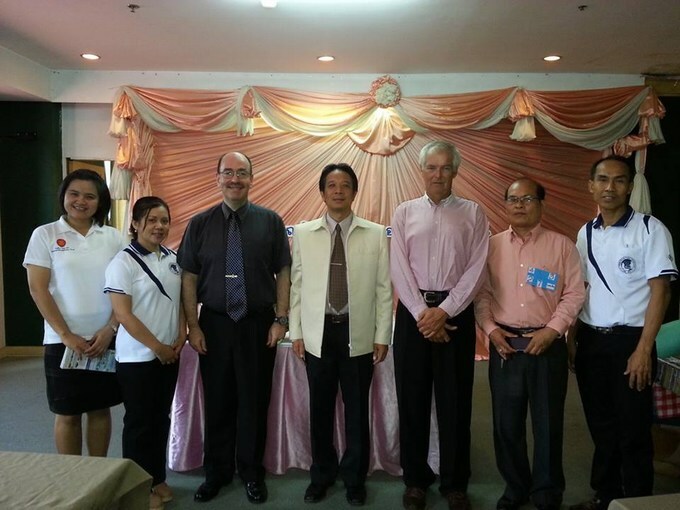 Khon Kaen University International College (KKUIC) in conjunction with Udon Education Foundation (UEF) are actively working with primary, secondary and tertiary education institutions to provide support and training in order to better prepare students and teachers for their lifelong learning and teaching needs. A successful 2 day workshop was held at Khon Kaen University International College in an ongoing commitment to assist high schools in the Isaan area with their English language teacher training. Look at the slideshow to see the teachers taking part in the workshop.